SYNOPSIS - Penny is sick of boys and sick of dating, so she vows: No more. She's had too many bad dates, and been hurt by one too many bad boys. EXCERPT - I, Penny lane Bloom, do solemnly swear to never date another boy for as long as I shall live. All right, maybe I'll reconsider it in ten years or so when I'm no longer living in Parkview, Illinois, or attending McKinley High School, but for now I'm done with guys. They are all lying, cheating scum of the earth. Yes, every last one of them. Pure evil. Sure, there are some that seem nice, but the second they get what they want, they'll dump you and move on to their next target. FL Speak - I read a chick-lit! A teenage girly book! And rofl it was one of the funniest reads of all times. Girls, friendships and the Beatles. This is what 'The Lonely Hearts Club is all about. This is the story of Penny Lane Bloom. Her parents are Beatles fanatics and its no wonder that she and her sisters were named after famous Beatles' songs. Penny lane, Rita and Lucy. 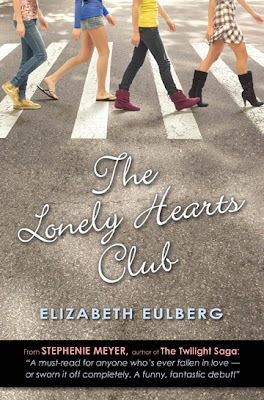 It was after her heart-break with her childhood friend that led to the formation of The Lonely Hearts Club. Soon girls were flocking to join Penny and her club. They all had it with jerks and realized that girls bonding together was much more fun. They could be themselves. Diane left her cheerleaders' team to do what she wanted, be a basketball player. The club grew popular while the principal and the male society fumed. No task was hard enough, no goal unreachable, The Lonely Hearts Club was the best thing to happen to them. And then, the President of the club, Penny Lane Bloom fell in love. Again. Ironic yeah, but i couldn't help but feel sad for her as she tried to push her emotions away and work for the club. In the end, all's well that ends well. But what's best about it is that you really, really would love to read the story unfold. Elizabeth jotted down a hit debut. I won't be surprised to see it made into a hollywood movie. This book makes you laugh and smile irrespective of your gender. This book took me back to Beatles and i started loving them all over again just as i loved them 7 years ago. It leaves you with a smile and a feeling of content that not many books can boast of. FL, i canNOT believe u reviewed this!! :D but i am glad u did! ;) love d review n would love to read this book. i picked the book because the cover looked dashing and the comment by Stephenie Meyer. Thankfully, it didnt disappoint.